I’m delighted to welcome fellow ancient world writer, Judith Starkston, to Triclinium. Judith has spent too much time reading about and exploring the remains of the ancient worlds of the Greeks and Hittites. Early on she went so far as to get two degrees in Classics from the University of California, Santa Cruz and Cornell. She loves myths and telling stories. This has gradually gotten more and more out of hand. Her solution: to write fantasy set in the exotic worlds of the past. Fantasy and Magic in a Bronze Age World. Hand of Fire was a semi-finalist for the M.M. Bennett’s Award for Historical Fiction. 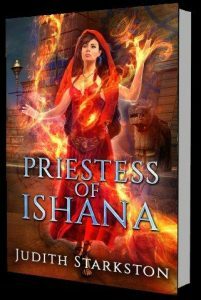 Priestess of Ishana won the San Diego State University Conference Choice Award. Judith has two grown children and lives in Arizona with her husband. 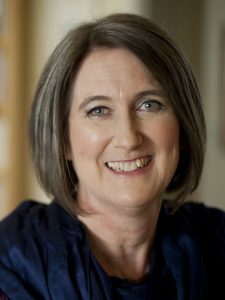 You can connect with Judith via her website, Facebook and Twitter. For a free short story set in her Bronze Age historical fantasy world (and a cookbook of foods in her novels), sign up for the newsletter on her website. You can purchase Judith’s books on Amazon: Hand of Fire and Priestess of Ishana. 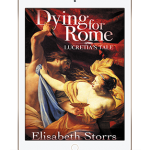 The impetus to start my first book came from wanting to tell a fully-voiced version of Briseis’s story from the legends surrounding the Trojan War. That dream gradually grew into the book Hand of Fire. Pretty quickly I was infected with the writing bug and it has become my fulltime occupation. As I researched Hand of Fire, I discovered an extraordinary queen who had ruled for decades over the most powerful empire in the world at that time (the Bronze Age Hittites). She had been lost to history until very recently. Her life and world inspire my historical fantasy series, starting with Priestess of Ishana. As to author influence, I am perpetually reading, especially in the genres of historical fiction and fantasy, and whatever I’m buried in at the moment prods me to think about my own writing in new ways. Recent authors I’ve loved include Robin Hobbs and S.A. Chakraborty. When I discovered the Hittite Queen Puduhepa, who became the model for my fictional Tesha, I found I had stumbled upon a ruler with an intriguing combination of a pragmatic approach to leadership and a mystical, magical outlook. Her strengths appealed to me as themes to explore, such as her diplomatic skills that kept her empire at peace and her nuanced understanding of the law and implementing justice. She brings to the forefront the advantages of female leadership in an often male-dominated world. For a number of years, I have been kidnapped by the cultures of the Hittites and Greece in the Late Bronze Age (around 1200 BCE). My academic training was in Classical literature and history, so that laid the foundation. But what has held me lately, is the pure fun of writing about people who grapple with similar issues and crises that the modern world does, and yet frame everything in a way so totally unlike ours that it throws one’s eyes wide open. And then there’s the magic. What’s not to love about stories set in a civilization that believed in magic? On the fun side, I’ve made extensive trips to Turkey, Greece and Cyprus to see firsthand the physical environment and explore key archaeological sites and museum collections. On the more prosaic side, I read lots of archaeological site reports, journals and books. Hittitology is actually a relatively new field. The Hittite Empire suffered the indignity of being forgotten to time (except for some Biblical references to groups we now call Neo-Hittites). The study of this culture arose once the ruins were found and excavated, and thousands of clay tablets were deciphered and translated. After years of telling my students not to depend on a thesaurus, I find myself reaching for mine frequently. However, I usually noodle around from word to word, listening and trying them in the sentence I’m stuck on. The word I settle on is most often one that came to mind indirectly through that process. I value the sound and cadence of my sentences, as well as the precision of one meaning over another, so it can take a ridiculous amount of time to craft any given sentence or paragraph. And I work hard to keep my language straightforward but appropriate-sounding for the ancient time that serves as inspiration for my fantasy. It’s only a line drawing, but when I see it, I feel as if Tesha is reaching out to me through time. The historic queen who inspires Tesha “signed” her correspondence and official decrees with her personal seal pressed into clay. She would have worn this seal as a ring or pendant. Archaeologists sometimes dig from Bronze Age sites plugs of clay, round-shaped with the imprint of seals, called bulla. I met with the director of my favorite museum in Turkey (the Çorum Museum) and had the moving experience of hearing him describe excavating the bulla on display in the case in front of us—Queen Puduhepa’s. He gave me a master of the line drawing done from this imprint that I now use as my author logo. The queen stands on one side, her son on the other under the protective arm of the Stormgod. Above them are the eagle wings joined by a sun disc that was the sign of the royal family. Around the outer edge are the cuneiform signs representing her name and status. 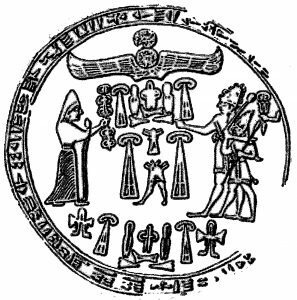 In the middle of the seal are symbols used in an alternate hieroglyphic writing system of the Hittites, identifying her as ruler of the Hittite Empire. Writing fantasy that involves magic requires some rules. There’s nothing more annoying than novels where characters pull previously unidentified magic out of thin air to get out of an insurmountable jam. In the case of my fiction, all the “rules” of magic derive from what the Hittites believed could and would happen in their world. They had many rites to accomplish basically magic things. My character Tesha is a priestess (as was her historical inspiration) so that kind of magic is hers to command, but it has very tight limits and patterns. Because it is fantasy, I do extend the application of those rules outward to raise the danger and increase the excitement. Tesha takes on her foes with a mixture of intelligence and magical skill. The greater the disasters I throw her into, the more I discover the depth of her abilities. I do use Scrivener. I love the ability that program gives me to see the layout of my whole novel and to slide scenes from one location to another. I love the “big picture.” A compact laptop goes with me all the time and saves me from having to decipher my illegible scrawl. My typing fingers are better at keeping up with my thoughts than my long hand. Read a lot of books as models to grow in your own style. Seek and listen to editorial criticism. I once heard an agent say that she thought the defining feature of a writer who would succeed was the ability to incorporate suggestions in a productive way. The most important advice: keep at your writing every day in some way or other. My next book is the second in my Tesha series. It takes place very soon after Priestess of Ishana ends, more fantasy and magic in the Bronze Age. I’m hoping it will be available this summer. Many thanks Judith. 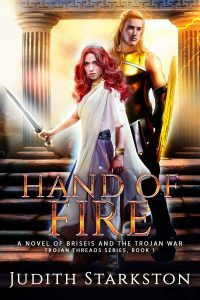 I enjoyed Hand of Fire immensely and look forward to dipping into the world of the Hittites! Great interview. I am also a history buff so I’m adding this to my TBR pile. This sounds like a great read. Thanks for pointing it out with this interview. The cover is fantastic! I enjoyed reading the interview and the book sounds like one that I would enjoy reading. I have been eyeballing both of these books for a while now. After reading this I think I’m going to pick both up. Can’t think of a better way to spend my weekend! Thank you for sharing insight into your creative processes. I love the mixture of fantasy and historical fiction. The story and cover both appeal to me. I would love to win a copy! Thank you. Great interview, Judith and Elisabeth. I had the feeling that like alternative history, historical fantasy has its rules. Very plausible that those rules derive from the Hittites’ own beliefs. Aside from the gripping novel, I enjoyed reading about the author’s process here. As a reader I always want to know what lurks between the pages. Many thanks.